Success in the Form of Failure – microBEnet: the microbiology of the Built Environment network. In this recent segment on Science Friday, Ira Glass interviews Stuart Firestein about how failure in science is not just inevitable, but is just as important to the advancement of knowledge as the success is. I know that every single person can relate to this idea, which actually applies to far beyond the sciences. 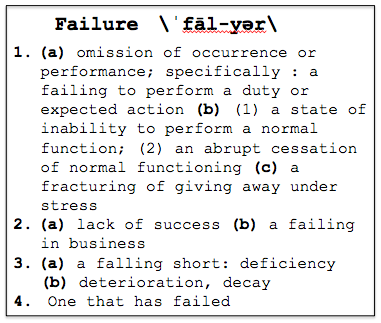 I post about it here, because, well, I think we need to talk about failure more than we do. I am no master of overcoming the frustration of failure; in my defense, however, we do live in a society that honors success and penalizes failure. I think both students and educators alike would really enjoy this listen; below I’ve included some of the highlights of the discussion entangled with a few of my own musings. Perhaps, the new perspective should be to not interpret failure as a defeat. As Firestein puts it, “If you embrace failure as part of the process, this is where you can be most creative and innovative, where the most interesting things happen … Failure in science means an interim version of what the world is really like.” While I agree with this statement, I do find it somewhat misleading in that it doesn’t quite allow room for the power of negative results. These are not failures per se, but are not advancements either. For how many failures it takes to get a success, the journals sure don’t publish that same ratio; which is quite a shame because so much learning happens in the process that is not shared. Journals, funding agencies, and even teachers — yes, teachers! — are responsible for perpetuating the negative connotation around failure. Journals only publish success stories, funding agencies support projects believed to succeed, and teachers spend too much time teaching the skills and facts that there is no time left for teaching failure. “This notion of failure being acceptable and being an integral part of the process most of us don’t get until we reach, frankly, graduate school when we’re going to become professional scientists. That’s when you learn that the answers don’t really count for much; it’s the questions you ask. You fail a lot and you have to learn things from the failures,” Firestein argues in his interview on the Science Friday segment. As a professor who runs his own research lab at Columbia University, he has first hand experience in this matter. He comments that for most of his graduate students, their theses are comprised of data that are acquired in the last 18 months of their entire 5-6 year graduate careers. Wow, that’s a lot of failure, er, I mean, learning! I’m glad I came across this segment because I’ve been dealing with my own series of failure as a graduate student in the sciences. The process of DNA extraction is well understood, right? I think so. You can extract DNA from just about anything now and biotech companies have a very firm grasp on their own unique kit chemistries. Well as it turns out, koala poop is no match for even the most reliable of DNA extraction kits and the theory falls apart not unlike the principles of space and time scaled to a quantum level. (This failure was mentioned in the segment, by the way). It has taken me nearly 2.5 months to finally optimize a kit for koala poop, which was a quite frustrating ordeal. But with a different perspective, each failure was a learning opportunity, and boy did I learn a lot about DNA extractions! Even more so, I proceed with my project with full confidence that I’m using the right method for my downstream applications. Of course I can’t get back all of that time, effort, money, and POOP I used to arrive at my ‘success’ and when it is published, it will appear as no more than a couple sentences in a methods section. So how can we teach failure and how can we teach it in a positive light? Some suggest we teach each success in the context of all of the failures it took to get there. Some teachers assign projects that don’t have clear or expected results. Some make failure a requirement. What are your thoughts about teaching our next generation of scientists to fail better than we did? Stuart Firestein, who was interviewed in this segment, is the author of “Failure: Why Science is so Successful”. I may or may not be suggesting a great, last minute holiday gift idea for your favorite student and/or educator. Again, here is where you can listen to the original discussion and here is where you can find Firestein’s book.